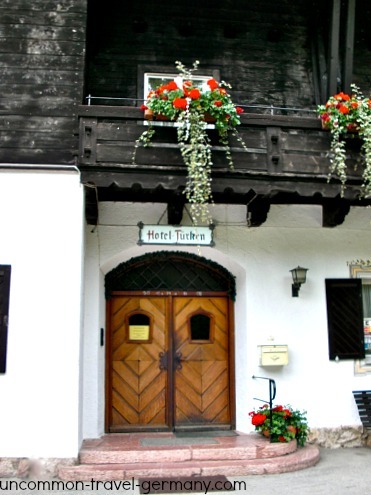 Sitting on the Obersalzberg, high above the town of Berchtesgaden, is the historic Hotel zum Türken. This little Alpine inn would be a gem even without it's fascinating past. If you're ready to get away from it all and return to a time before technology demanded our attention every minute, the Türken is a genuine oasis. There are no phones or TV's in the rooms, just the sounds of the birds and the wind in the trees. The Türken is an old-time Alpine hotel with spectacular views of the mountain peaks. After you enter through the heavy wooden door, you'll find yourself transported back to the 1940's. The cosy parlors are furnished with comfortable, overstuffed chairs and there is a serve-yourself bar with an array of beverages and snacks. Guests help themselves on the honor system. Dropping into the lounge in the evening is a good way to meet the other guests. The hotel has it's own computer, but there are no hook-ups (or telephones) in the rooms. There is a public phone available in the hallway, but most people travel with cell phones anyway. The room are European style - small, basic, but comfortable. You can get a room with or without a bath. The rooms without bath share one down the hall. There is definitely a feeling of being in an old hotel, which is part of its charm. This is not a good match for anyone who must have all things modern. Singles start at € 45 without bath, € 80 with bath; doubles, € 90 without bath, € 130, with bath. Breakfast is included. The hotel is open May to October (2016). You can reserve a room via email (hoteltuerkenobersalzberg@t-online.de) or by phone (+49(0)8652-2428) or fax (+49(0)8652-4710). 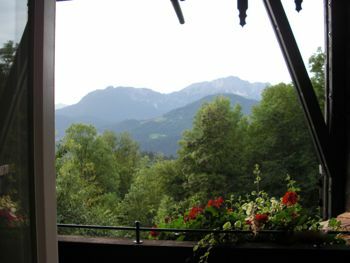 Staying here makes it very convenient for touring the Obersalzberg. 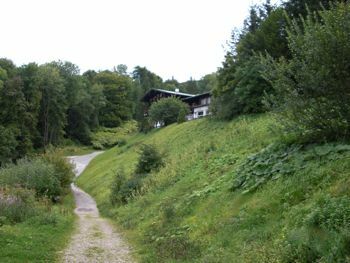 Two of the most interesting sights are literally on the doorstep: the bunkers under the hotel and the ruins of Hitler's Berghof just inside the woods next door. 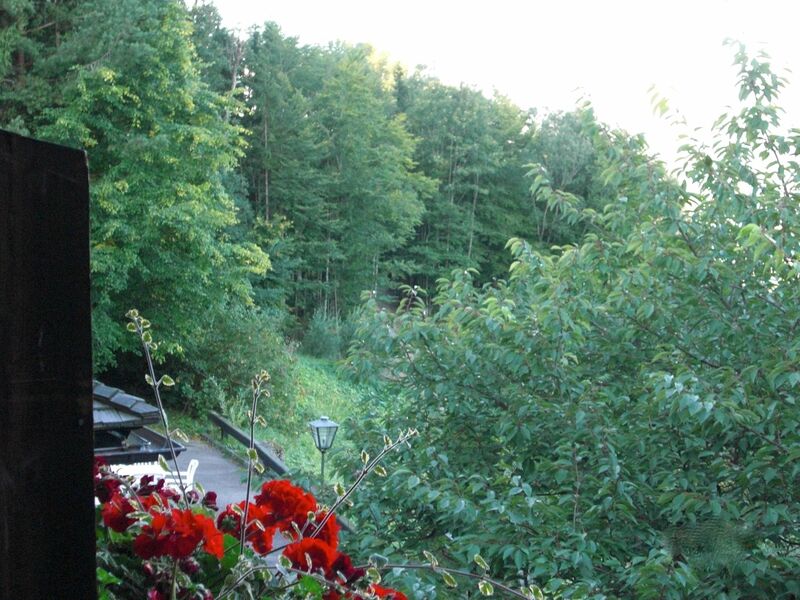 The photo above was taken from the balcony of the hotel, looking towards the woods where the Berghof used to be. The ruined foundation walls are still there, along with a billboard providing information about it. They request that guests make reservations; they also must arrive before 6:00 p.m. when the hotel desk closes. The front door is kept locked 24 hours a day to discourage tourists trying to see the building; only guests have a key. Breakfast is served in a large room looking out onto the Alps and there is a delicious assortment of cheeses, cold cuts, breads and cereals. Eggs are available on order. There is no restaurant in the hotel, but there are plenty of other options. 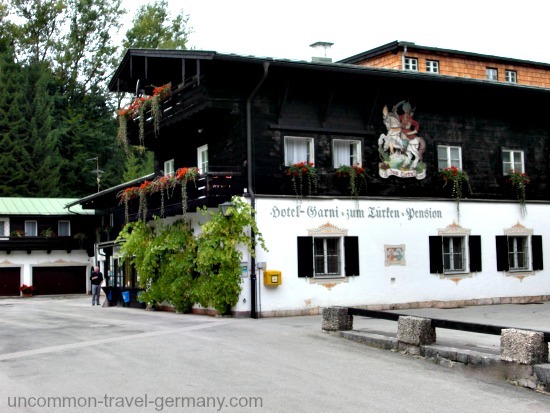 Guests can go into Berchtesgaden for lunch and dinner; it's only a 10 minute drive down the mountain. It is easy to call a taxi if you don't have a car. Also, the bus from the Documentation Center will take you to the Bahnhof and you can get another bus or walk up to the town from there. The restaurant near the parking lot of the Documentation Center serves meals during the day. The last bus in the evening going up to the Obersalzberg leaves from the train station in Berchtesgaden at 6:00 p.m., and at 5:00 p.m. on Fridays and Saturdays. There is a 24 hour taxi stand at the Berchtesgaden Bahnhof, so you can always get back up after an evening in town. Taxis are available in town as well. As an added bonus, there is an extensive bunker system under the hotel that is open to the public for a small fee. This one connected to the Führer's bunker next door. 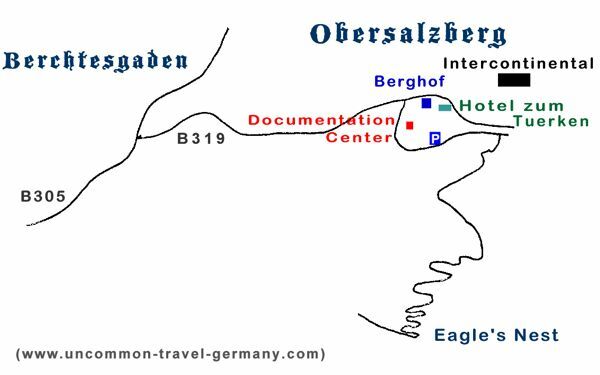 For more on the bunker systems, see Obersalzberg Bunkers. The first building on this spot was built in 1600's and called the Türkenhäusl, or Little Turk House, believed to be named by a soldier returning from the war against the Turks (Siege of Vienna?). The current building was started in 1911 and was more or less in it's present form in 1923 when Adolf Hitler first came to the Obersalzberg. 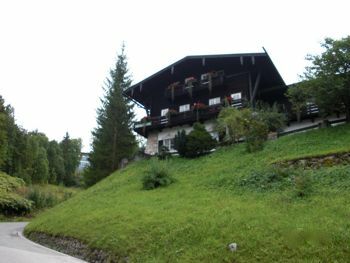 The owner, Karl Schuster, was rather outspoken in his disapproval of the new regime and had refused to sell, as Obersalzberg residents were being pressured to do. He got into trouble after Hitler established his home in the house next door. 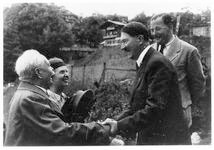 One evening in 1933, the SS were carousing in his lounge when Herr Schuster arrived back at the hotel. He ordered them out and made some derogatory remarks about too many SS and brownshirts being there. Martin Bormann then ordered him to sell the hotel; he refused again. Herr Schuster then spent three weeks in Dachau and "agreed" to sell. 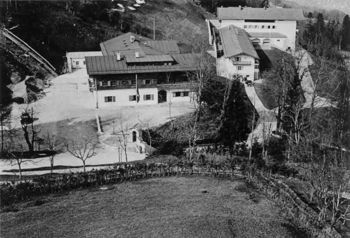 As you can see below, the Berghof was very close to the hotel; Hitler's home is just below and to the right of the Türken in the photo. In the left photo below, Hitler is standing in his driveway, with the Hotel zum Türken above. On the right, the same spot today. The Hotel zum Türken was used by the security service (SD) and had an SS detachment stationed there, guarding Hitler next door. The building was severely damaged in the bombing raid of April 25, 1945. 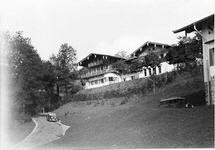 After the war, Karl Schuster's daughter was able to get the hotel back and restore it. Her daughter, Ingrid Scharfenberg, ran the hotel for many years until her recent death in 2013. Now her daughter manages it; the hotel has been in the family for four generations. 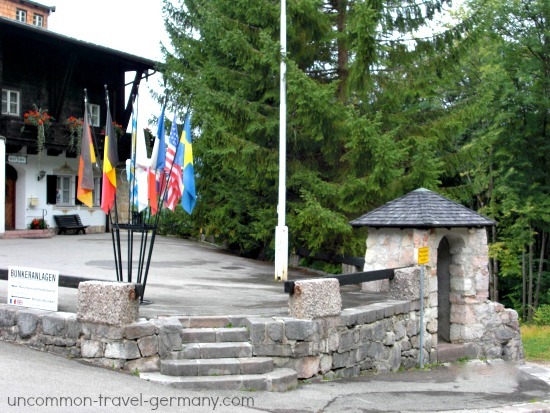 For more photos and information on the history of this mountain and the hotel, see History of the Obersalzberg, The Obersalzberg Today and Hitler's Berghof. 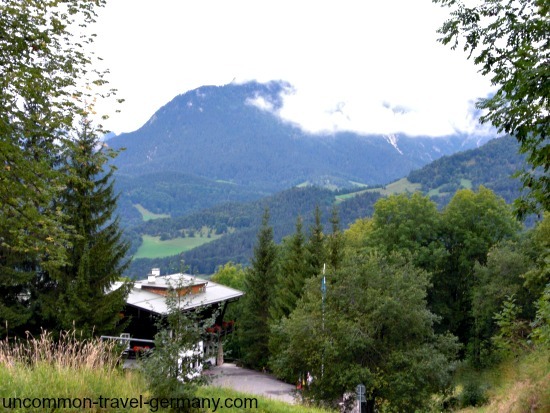 This is a great place to stay while you are exploring the Obersalzberg. The prices are very reasonable and the atmosphere is like nothing else; the ghosts of the past are thick here and the views are superb! 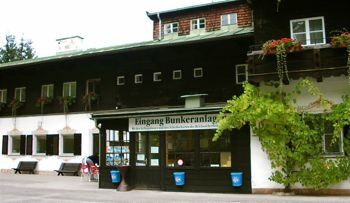 See the hotel's own website: www.hotel-zum-tuerken.com, for more info and reservations. Also, www.thirdreichruins.com is an excellent website with lots of information and historical photos of the hotel and the Obersalzberg.